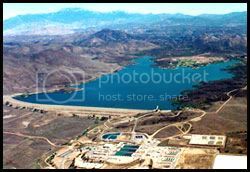 Lake Skinner is located near Temecula in Riverside County and is most famous as a striped bass fishery. There is also a good population of largemouth bass, channel catfish, and huge carp. The carp in this lake have been known to reach weights of over 30lbs. The shoreline access is limited and can be very weedy during the warmer months so the best way to fish this lake is by boat. There are boat rentals available and if you have your own boat make sure to check the regulations before heading out as they are really strict. A 4-stroke engine is mandatory. Location: Take the 15 freeway to Temecula, get off at Winchester Road (highway 79) heading north towards Hemet. Turn right on Benton Road, go to end, turn right to main gate or take 15 freeway to Rancho California Road. Go north 10 miles to main gate. Hours: Summer, 6 a.m. to 7:30 p.m.; Winter, 6 a.m. to dusk. Features: Family and group camping, fishing, trails, marina, camp store, boat rentals/launch, swimming (summer only). Fishing: $5, age 16 and up; $4, age 5 to 16. Launch fee: $2.